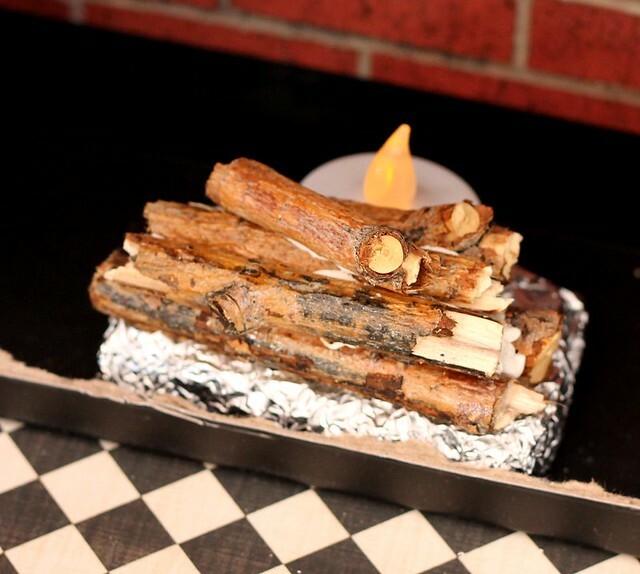 Make a Fireplace for your Dolls – $20 or Less! 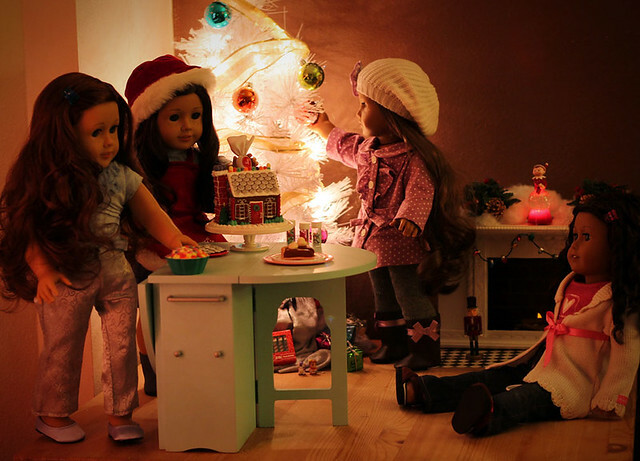 Last holiday season we built a fireplace for the dolls. My goals for the project were to keep it inexpensive, easy to store, and simple to make. I have a propensity for stabbing myself when cutting vegetables, so I stay far, far away from power tools. The following tutorial requires no woodworking skills, but may require adult supervision as some some cutting is required. The fireplace is sturdy enough for gentle play, but was designed primarily to be a decorative piece. The scale is a little small for the 18 inch girls but it wouldn’t be hard to make the fireplace larger if the scale bothers you. All supplies came from Hobby Lobby (except for the spray paint because it’s less expensive at Walmart) and I spent just a tad under $20. If you don’t live near a Hobby Lobby, most of these supplies are available in other craft stores or online. I already had glue, Mod Podge, and Model Magic on hand, so those supplies are not included in total project cost. The “body” of the fireplace is a black photo storage box. Cut a rectangle from the bottom of the box. Mod Podge or glue brick printed scrapbook paper to the back (which is the inside of the lid). This is an optional step, but it looks really cute when the “fire” lights up the inside of the box at night. The “hearth” is a thin sheet of birch (I purchased pre-cut in this size) that I Mod Podged with scrapbook paper. The other side has the brick paper because I couldn’t decide what I liked better. You can also use cardboard for the hearth or omit it altogether. The fire is made with sticks from our backyard. To stick them together I used Model Magic (the Crayola modeling clay that dries) and a little squirt of Alene’s tacky glue. I’m sure you could use any type of clay, I chose Model Magic since it will dry. I was having a hard time getting the “logs” to stick together with just glue, but the clay/glue mix worked like a charm! I have the logs resting aluminum foil at the moment but I’d like to find or make a better grate at some point. Or maybe I’ll just spray paint it black. Behind the logs, I have placed a flickering LED light for fire. It’s hard to see in the photo, but very cute at night when the room is darker. The rest of the fire place frame is made from balsa wood with another birch sheet on top. The balsa wood came in one long sheet that I cut into four parts with a hand saw to construct a rectangle. The two sides are the same size. the top piece is a little wider then the bottom piece. I used the size of the photo box as a guide when deciding what lengths and widths to cut the balsa wood. The frame rests over the photo box, so it’s just slightly wider and taller. I glued the frame sides together with Alene’s tacky glue. I glued the pre-cut birch sheet on top to act as a mantle. Balsa frame for the fireplace. Turned around so you can see! 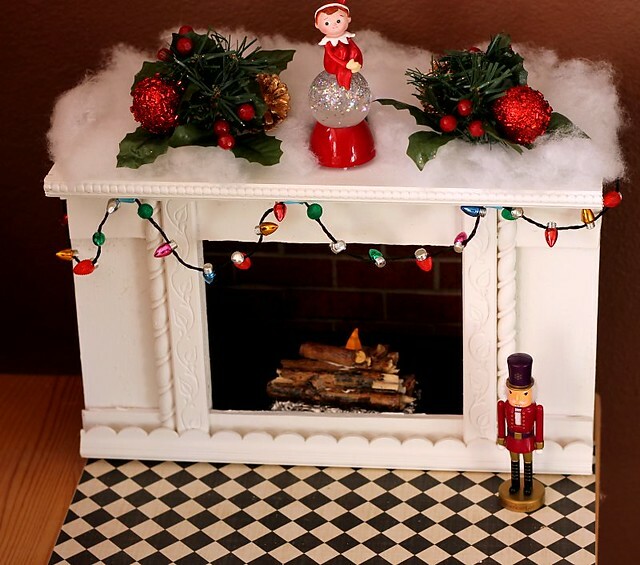 I bought a package of pre-cut wood trims ($6.99 – used a 40% coupon on this as it was the most expensive item) and used bits and pieces to make the molding along the edge of the mantle and to decorate the front around the opening of the fire place. I used a hand saw to trim the pieces to size and glue to attach the trims to the balsa wood frame. After letting the glue dry overnight, I took the fireplace frame outside and spray painted it white. I spray painted a second coat after the first dried. I did not permanently attach the wood frame to the photo box. You could glue the frame to the box if you wish, but it’s easier for me to store as separate pieces. My Christmas decor is not included in the $20 total, but everything but the nutcracker is also from Hobby Lobby. The Elf on the Shelf was $6.50, the Holly pieces were $2 (for both), the “snow” is just fiberfill, the lights on the mantle light up and flicker. They are actually a necklace but were with the Christmas decor at Hobby Lobby. 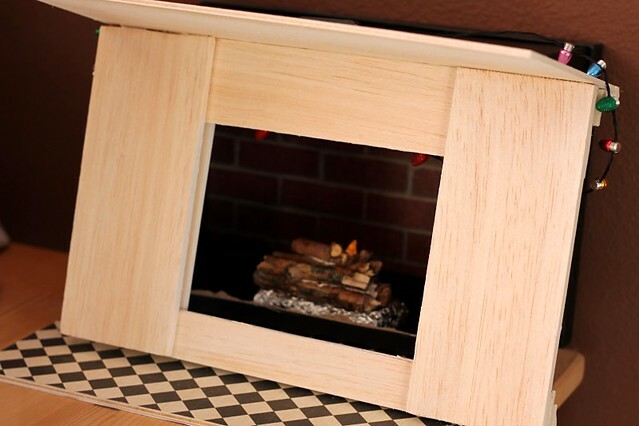 You can make a simpler version of this fireplace with just the photo box (more carefully cut out in the front. I did a sloppy job knowing I was going to cover it). 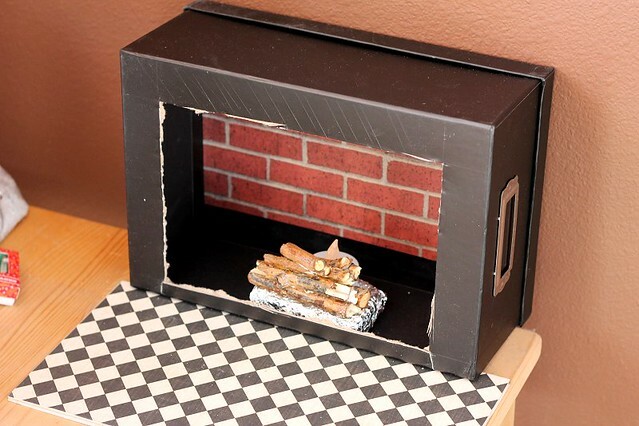 The photo box was $2 and the scrapbook paper was $0.59 a sheet, so if you have glue or Mod Podge and few sticks in your backyard, you can make a “quickie” fireplace in under an hour for less then $3! I hope you have enjoyed this tutorial and please let me know if you have any questions! This entry was posted in Dolly Holiday, Free Doll Patterns and Tutorials and tagged 18" Dolls, American Girl Dolls, Doll Tutorial, Dolly Holiday.